Dentures restore smiles. 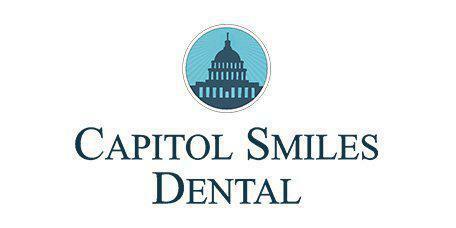 Patients living in Trenton, and Ewing New Jersey and surrounding communities can visit Capitol Smiles Dental for denture fitting after they’ve lost teeth or had them extracted. The team can create custom dentures that look and feel very natural. There are 2 types of dentures: full and partial. Full dentures are used by people who need to have all of their teeth replaced, while partial dentures are used to fill in the gaps between natural teeth. Whether the dentures are full or partial, they're secured with plates, clips, or denture adhesive to create the closest fit possible. Complete dentures are attached to a gum-colored base that suctions to the gums. Partial dentures also have a gum-colored base and are typically attached to a metal frame. Both types of dentures are designed to serve as tooth replacements, but partial dentures also serve the purpose of keeping the remaining natural teeth from shifting. Flexi-partial dentures are crafted from light and pliable materials. Traditional dentures are made from a rigid plastic base, which may make them less comfortable. Flexi-partial dentures allow for a more comfortable fit. These dentures may be a good choice for partial denture wearers who want a metal-free and hypoallergenic option that’s also very comfortable. What’s eating with dentures like? There’s an adjustment period with new dentures, and eating is a big part of that adjustment. Many new denture wearers find that cutting food into very small pieces is helpful. It's best to avoid hard, sticky, or chewy foods when adjusting to new dentures. After a few weeks of practice, most denture wearers are able to resume their usual eating habits with no problems. Dentures simply fill in the places where teeth are missing, which means that a patient’s appearance changes for the better. For people who have a sunken look due to tooth loss, dentures may help fill out their face. What’s the best way to take care of dentures? Dentures must be cared for properly to keep them in good condition. This includes removing and rinsing after eating, practicing good oral health after removing the dentures, brushing them daily, and soaking them overnight to keep them hydrated. If dentures start to shift or feel uncomfortable, contact Capitol Smiles Dental right away. Relining or rebasing may be needed after a few years to ensure a continued good fit.